Cold Pour® is a fluid additive which has an extremely low pour point, which when added to existing hydraulic or other petroleum based fluids, makes these fluids capable of cold weather operation. Cold Pour® will lower the pour point of hydraulic and gear oils while not appreciably changing the high tempurature viscosity. By allowing the pour point to be lowered, hydraulic pumps are saved from cold start-up problems and possible burn outs. To be effective, a minimum fluid dillution of 25 percent is required. 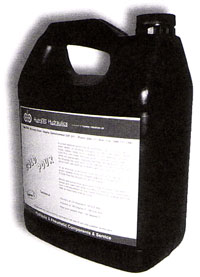 Heavier fluids will require upwards of 50 percent dilution of Cold Pour® for satisfactory winter operation. Mobile and automotive applications that Hydratec has been involved with have had great success in leaving the conditioned fluid in the equipment all year round, thereby doing away with the need to seasonably change the fluids. Environmental handling charge of $0.10 / litre is applicable. Federal and provincial taxes extra if applicable. Container deposit is extra and refundable. WHMIS certificates are readily available upon request. If you need help with a specific application call one of our cold weather technicians.